Many people have the same problem with their garage as many of us do with our lofts; they become great places for stashing stuff. If you want to make sure that there is still sufficient space to put away your car at night, then you need to declutter. Most of the stuff that we hide away comes under the heading of ‘may be useful someday’, when most of it is really past its best. Before you think of storage ideas, you really need to assess what is worth keeping and what is useless clutter. 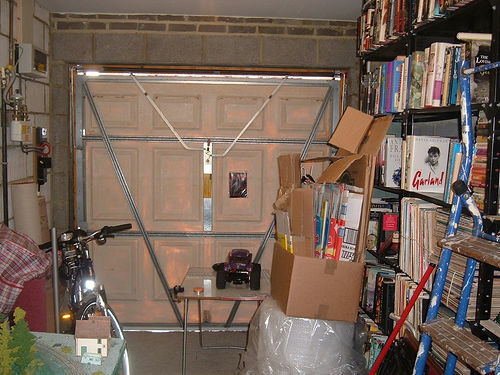 Below are some of the top tips for dealing with clutter and making space in your garage. Once you have resolved to clear your garage start by sifting things into piles or boxes. You should have a pile for keeping, one for stuff that needs to be thrown away, and one for stuff to be given to charity. You might also decide to put things that you are unsure of into a further pile. You need to be ruthless here; old leads and plugs, along with the broken garden rake really do need to be thrown out. If you want to make some money out of items that you never use then you might want to consider having a car boot sale. Once you have sorted out the clutter, take a good look around you. Obviously you will want to park your car in the garage but that should still leave you plenty of space to use for storage. Take a look at the pile of stuff that you want to keep and divide them into further piles, e.g. car accessories, garden tools, and do it yourself equipment. Once you have sorted things in this way, the next step is to consider some self storage ideas. If you are a do it yourself fan, you might want to consider putting in a work bench at one side of the garage. Buy some see through storage boxes to go underneath the bench and pack different types of tools and materials into their various boxes. Keep everything associated with your car, including cleaning materials, on the other side of the garage. Don’t forget that the walls of the garage are great for hanging any tools that you use on a regular basis. When everything has its own place, you’re a lot less likely to end up with a garage full of junk. Once you’ve sorted the items that are to remain in the garage, and given them a place, it’s time to deal with what is left. Put large, broken items to one side, ready for the tip and bin the rest of the rubbish. Pack up anything you intend on giving to charity and then deal with any other items: either store them in the loft ready for a car boot sale, or be ruthless and add them to the rubbish pile. This guest post was written by Amy Fowler for Bingham Self Storage: storage experts in Nottingham. Cleaning your place when your tenancy is over!